A collection of delicious sides I’ve made to complement my main dishes. The next Thanksgiving related recipe I would like to share is this side dish. My mom told me to come up with something for dinner Wednesday that would go with the pork chops. She and my sister are on this crazy (in my opinion) diet and cannot eat a lot of things, even in the vegetable category. I wanted something with green beans and it couldn’t be green bean casserole, so I took to google. I found many recipes, but this one on The Kitchn, sounded really good and simple. My mom and sister cannot have potatoes, so we substituted rutabagas instead. You can cook them the same way you would a potato and they are similar in taste. I had to make a couple other modifications since I was making this for more people and it is not summer, and could not get fresh corn on the cob. So I used frozen of both and increased the amount of beans. For the diet version, they did not get corn or cheese and didn’t have the sauce over the top, just lemon juice. The full version I made, was really good and they said that their diet version was great as well. Both mom and grandma wanted the recipe and even my picky baby sister was eating it. That’s a good sign. Put the rutabagas in a medium-sized pot with one tablespoon of salt and cover with cold water. Bring the water to a boil and then reduce to a simmer. Cook until the potatoes are soft. Scoop the rutabagas out with a slotted spoon and into a serving bowl. Bring the water back to a boil (adding more water if necessary) and blanch the beans for 3-5 minutes, until they are bright green and softened but still have some bite to them. Remove with a slotted spoon and add to the bowl with the potatoes. Cook the corn in the microwave as per the package direction while the beans are cooking. While the potatoes and beans are cooking, heat a teaspoon of oil in a skillet over medium heat, and cook the onions until they are soft and fully caramelized. This may take some time, so be sure to start early enough so that everything finishes close to the same time. Transfer the cooked onions into the bowl with the potatoes and beans. With the skillet back over medium-high heat, melt the butter. Continue to cook it, swirling the butter occasionally in the pan, until the butter browns and begins to smell nutty. Remove from heat and whisk in the lemon juice and 1/4 teaspoon of salt. The lemon juice will make the butter sizzle up and sputter before cooling down. Drizzle the lemon-brown butter sauce over the vegetables and toss to combine. Sprinkle with cheese and add salt and pepper to taste. Serve while warm. 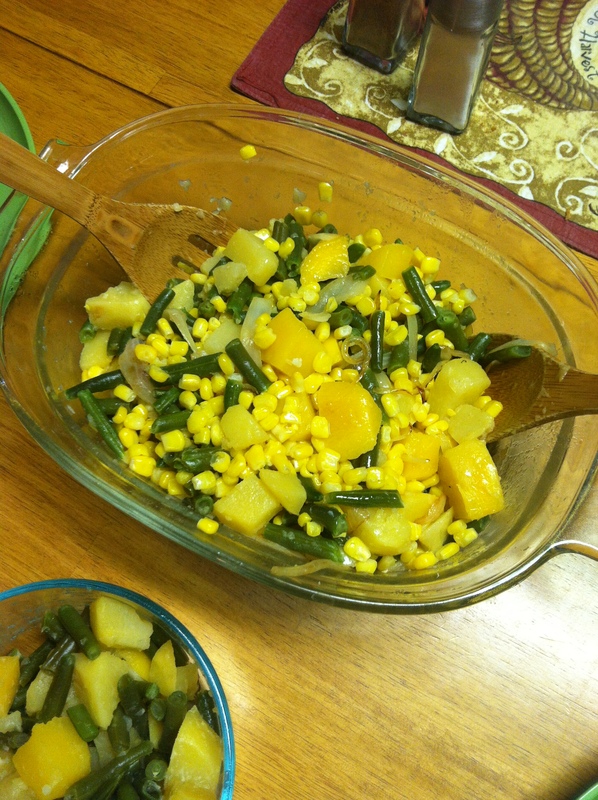 This entry was posted in Perishable Item, Recipe Box, Side Dishes and tagged Brown Butter, corn, green beans, Rutabaga, side dishes on December 10, 2013 by perishableitem. I hope everyone had a great long weekend and Thanksgiving! I went home for the first time after spending six away. I made a few great things while I was there and I am going to share a few of them here. The first ones are the side dishes I made for Thanksgiving. Because I am an uber geek, I get weekly emails from Cooking Light that typically have a string of recipes for you to try. The week before Thanksgiving was recipes with sweet potatoes. And I love sweet potatoes, so I went through all of them and picked one, Streuseled Sweet Potato Casserole, for Thanksgiving dinner. We were going to have regular, savory, mashed potatoes, so I decided to go with a sweeter recipe with the sweet potatoes and no marshmallows. This recipe could be dessert. It was so good. I only made a couple modifications because I was cutting the recipe in half. Sadly some people do not share my enthusiasm for sweet potatoes or cannot eat them right now due to diets. I did not half the egg or streusel topping. I also used heavy whipping cream instead of half and half because we didn’t have half and half. I might have used a bit of skim milk to cut it a bit, but I don’t remember. If I did, I didn’t use much. Either way it was really easy to make and maybe even more delicious as a leftover. Make it for Christmas, you will love it. The second recipe is one that I sent to my mom weeks before Thanksgiving telling her we would be making it. The recipe, Citrus and Pomegranate Brussels Sprouts, is from A Beautiful Mess, one of the blogs I follow. Another easy recipe to make that was really delicious. I love pomegranate seeds and since semi growing up, I also love Brussels sprouts. It is also very pretty. I hope you give it a try as well at Christmas. Place potato in a large pot and cover with water. Bring to a boil. Reduce heat; simmer 12 minutes or until tender. Drain. Combine the cream, syrup, vanilla, salt and egg in a large bowl, stirring with a whisk. Add potato to egg mixture; beat with a mixer at medium speed until smooth. Spoon potato mixture into a 9 x 9-inch baking dish coated with cooking spray. Slice the Brussels sprouts in half. Coat the Brussels in the olive oil. Place the sprouts cut side down on a baking sheet and bake at 375°F for 12-15 minutes. Combine the sprouts with the bread crumbs and a little salt + pepper. Butter a baking dish and pour the sprouts into the dish. Bake at 375°F for another 15-20 minutes. Squeeze on some lemon juice and sprinkle on the pomegranate seeds just before serving. This entry was posted in Recipe Box, Side Dishes and tagged brussel sprouts, casserole, sweet potato, Thanksgiving on December 3, 2013 by perishableitem. Everyone has been posting their favorite summer salads up lately and I have been enjoying several different variations this summer. I am especially hooked on adding fruit to salads like strawberries and oranges. I am also big on avocado and arugula right now. I mean how do you really go wrong with any of those things? This combination is my current favorite creation. I first tried it with an orange, kind of copying this Kale Salad, then I didn’t have any oranges but I did have a peach and it was AMAZING! I’m sure it’s great with other fruits. Try it, try it, thy it! Toss all ingredients except the honey, oil, salt and pepper together. Drizzle with honey and olive oil. Sprinkle with salt and pepper to taste. 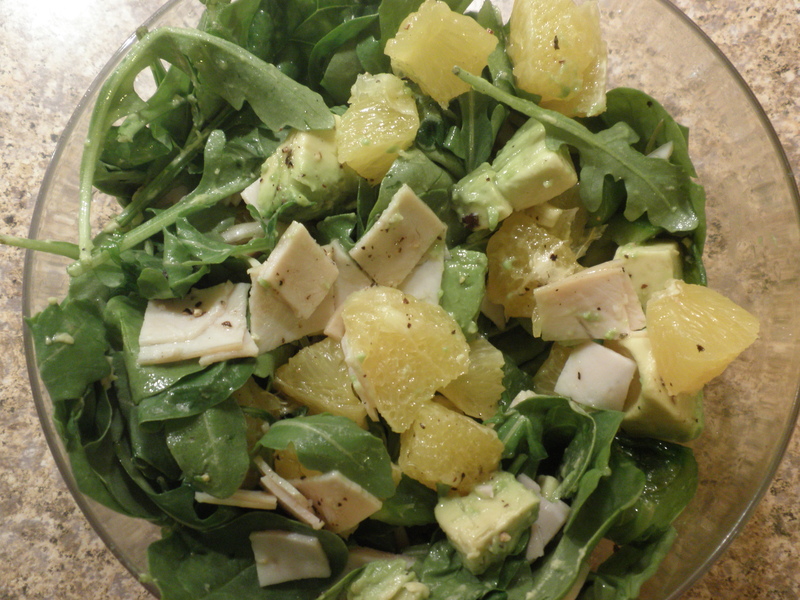 This entry was posted in Recipe Box, Side Dishes and tagged arugula, avocado, orange, peach, turkey on August 8, 2012 by perishableitem. Bet you’re surprised to see ‘kale‘ pop up on this blog again so quick. I am. 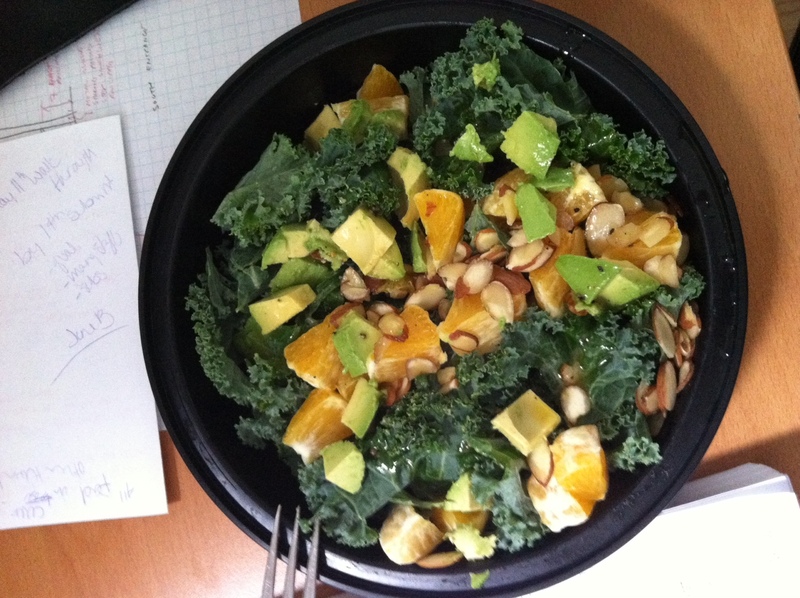 But when Jenna at Eat, Live, Run posted up this Kale Detox Salad with Orange and Avocado, I knew I need to try it. Like I mentioned before, I heard kale was not the best in salad form, but this was great. It was a bit chewy, but it was fine. The simple dressing of orange juice and olive oil with a bit of salt and pepper is perfect. I basically just tossed this together after looking at the ingredient list, so the recipe below is more approximate numbers, but I am pretty sure it would be hard to mess up anyway. I should have enough dressing to last me the week, (according to Jenna it will last that long in the fridge) and I cut up the rest of the orange to toss the salad together quickly for my lunches the rest of the week, (I tossed this together Monday night). Give it a try, I’m pretty sure you will love it. First, make the dressing. Combine the juice of one orange with the olive oil, pinch of sea salt and pepper. Shake or stir until very well combined. Set aside. For the salad, peel and divide the sections of the orange, then cut the sections into 4 pieces. Toss about a half a cup of oranges with the kale, almonds, and avocado. (Use the rest of the orange for future salads). Toss 3 or 4 tablespoons of the dressing into the salad, mix and enjoy! This entry was posted in Recipe Box, Side Dishes and tagged almond, avocado, kale, orange, salad on May 4, 2012 by perishableitem. I have not made brussel sprouts in a long time. Try over 10 years ago in some high school home ec class, (the closes to domestication I ever got). That was the first time I ever tried them too. I remember we steamed them and I did liking them, mom was shocked. After that I’ve had them here and there, but never really sought them out. I have been really excited to make something with them and have collected several recipes. These past few weeks I have been having the same issue with brussel sprouts that I was having with carrots, and kept forgetting about them. I finally roasted some up and they were delicious and I always remembered. I used a recipe from poppytalk but I cut the spouts amount in half but otherwise I stuck pretty close to the recipe. I hope you like them. I know they don’t look amazing, but they are! Trim the sprouts by cutting off the stem end and peeling back a layer of leaves. Cut the sprouts in half. Soak sprouts in a bowl of cold water, giving them a good shake so that any dirt falls to the bottom of the bowl. Scoop out the sprouts and dry them with a clean tea towel. Place on a cookie sheet and drizzle with olive oil. Use your hands to roll the sprouts around so that all the sprouts get evenly coated. Sprinkle with salt (I like tobe generous here) and the aleppo pepper or cayenne. Bake for 20 to 30 minutes, giving the tray a shake once or twice, until crispy and tender. Serve immediately. 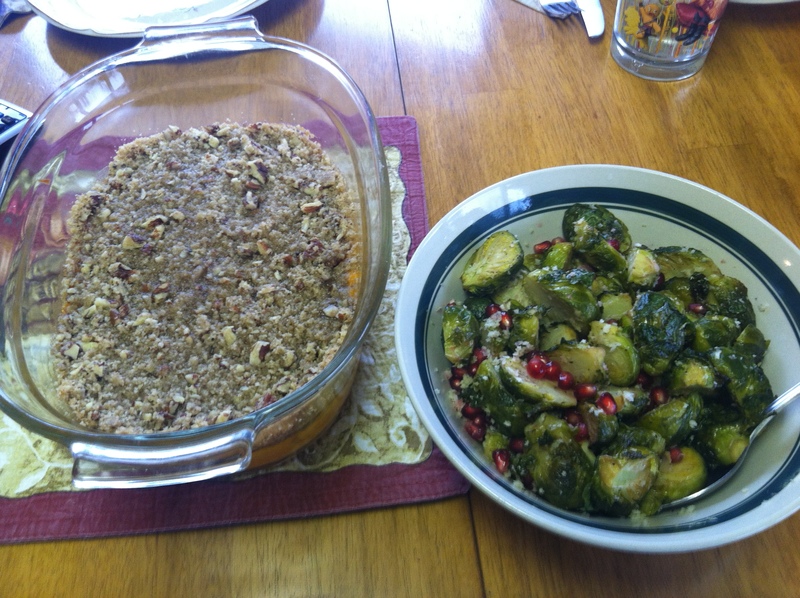 This entry was posted in Recipe Box, Side Dishes and tagged brussel sprouts, pepper, sides on March 13, 2012 by perishableitem. I had some leftover squash I need to use up before it went bad so I decided to try this quick side recipe from my Great Food Fast cookbook. I had been wanting to try a simple roasted squash recipe besides my usual butter and brown sugar, but I don’t think this is the one for me. I shared with my neighbors, who liked it, but there was something I didn’t quite like. It was okay, but maybe I just added too much sage, I didn’t measure it. Maybe I just don’t like fresh sage, even though I have never noticed a dislike of sage in general before now. I was not sure how much squash I had to use, it seamed to be about 2 pounds, like the recipe called for, but maybe it was less. Another good reason to hope for the food scale I ask for from Santa this year. Give the recipe a try and let me know what you think. Remove from heat and toss with sage. This entry was posted in Recipe Box, Side Dishes and tagged butternut squash, sage, sides on December 21, 2011 by perishableitem. This was my fourth Thanksgiving at my friend K’s parents house with her whole family in Connecticut. I cannot thank them enough for letting me join them year after year. I was waiting for my invitation to join in this year, and apparently it is now understood that I am invited. I just need to confirm. It is very kind of them to put up with me for a long weekend, feed me, give me alcohol of all varieties and Anginetti cookies, all in exchange for a bottle of wine and being able to reach the top shelf when K’s brother isn’t around. I was thinking this year I should make a pie or something else too, but time just ran out. November has not been any less busy than October like I thought it would be. Because of that, I had some carrots and parsnips I bought at the farmers market with great ideas of soups and glazes that never happened. I brought them up to Connecticut figuring we could use them over the weekend. So tasty there were no leftovers. Me: I was thinking we would just chop them and make some sort of maple syrup or honey glaze. K: Sounds good, I wish we had some ginger. Me: Oh, I had one and threw it in too. I was thinking maybe some coriander? Me: Naw. But something like that. Around this point K stuck her head in the spice cupboard and kept rattling off items until we ended up with orange peal, apple cider vinegar, and rosemary to mix with our ginger and maple syrup. They turned out really well. Most people had not tried parsnip before or had not had it in a long time, so it was an adventure for all in the end. I think this is an excellent way to introduce parsnip to anyone who maybe apprehensive about it. It is so tasty! Makes about 8 sides, we didn’t actually measure anything besides the veggies, so the measurement are about what we used. Peal the carrots and parsnip. Cut into one inch pieces and toss with olive oil. Place in a 9 x 13 baking dish. Peal and zest the ginger and mix in a small bowl with the syrup and vinegar. Pour over the carrots and parsnip. Toss lightly to coat. Sprinkle the orange peal and rosemary evenly over the vegetables. Bake for 45 minutes or until the vegetables are tender when pierced with a fork. This entry was posted in Recipe Box, Side Dishes on November 26, 2011 by perishableitem.